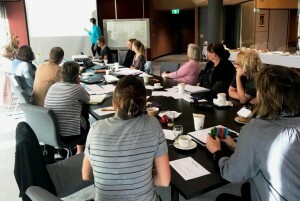 SGGPCP was excited to host the first in a series of workshops in Glenelg Shire about alcohol and underage young people, in a bid to improve outcomes for young people. We are developing a new process which brings together the Communities That Care framework, systems thinking and local knowledge and action. The session was ably facilitated by Andrew Brown (Deakin Uni) with expert input from Prof John Toumbourou (Deakin Uni/ CTC Ltd) and local key stakeholders. The session drew on local knowledge, to demonstrate pictorially the complexity of the influences on underage drinking. This will enable us to better understand what prevention strategies will help bring about effective change. The project is supported by funding from the Alcohol & Drug Foundation’s LDAT program.